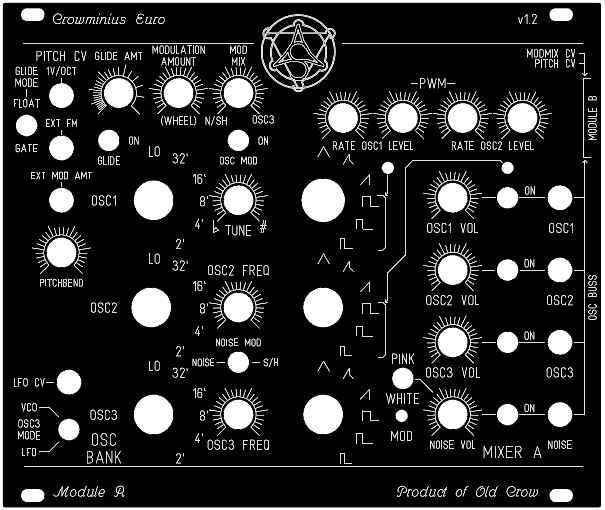 Suit & Tie Guy asked for a module that was the filter/envelope/amp portion of my Crowminius. So, I made what I call "Module B." 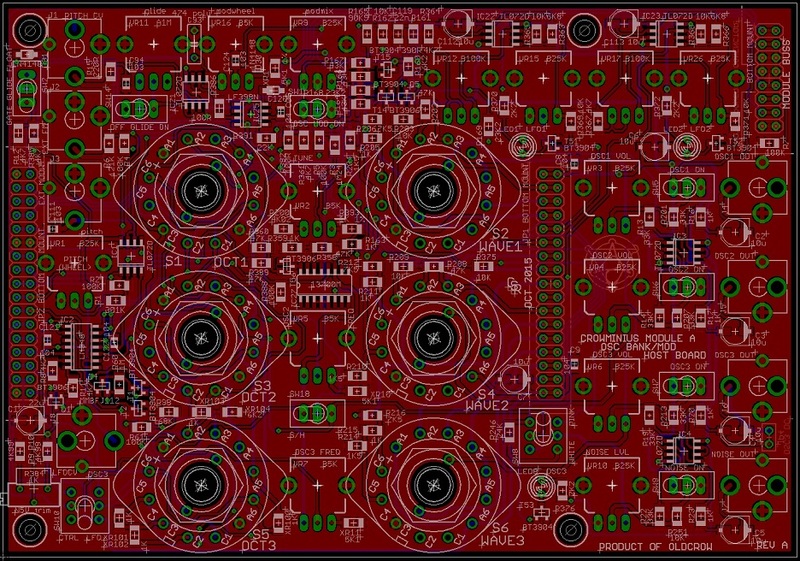 I am designing module A (osc bank & mod) while waiting for the module B front panel to arrive. I might make these pre-assembled in the future but crOwBX Euro comes first. So are you going to see those preassembled +panel ? My goodness! I will buy both modules as soon as they are available. Pre-assembled with panel please and thank you Crow! amazing! if you need help with doing preassembled modules, why not cooperate with suit&tie? Got module A's layouts done. 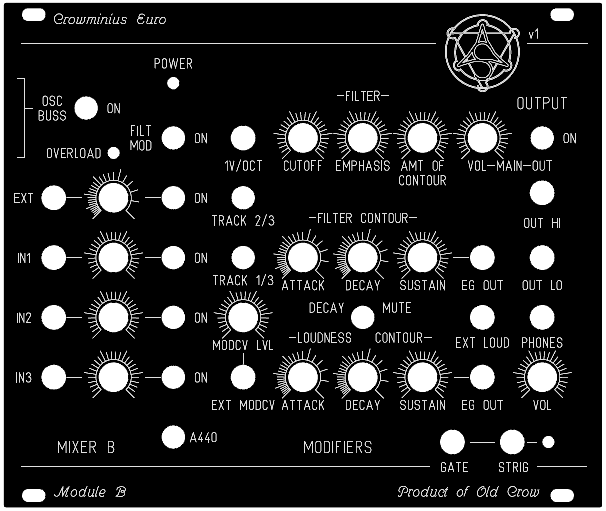 Module A is the oscillator bank/modulation half of Crowminius. It is also a bit more complex than module B.
I tried to provide additional input and output signals as befits the modular environment. On module B, each EG has output jacks, and the filter has a spare external mod CV input w/attenuator in addition to the usual 1V/Oct jack (with jack switchover from the pitch CV that can be provided from module A). 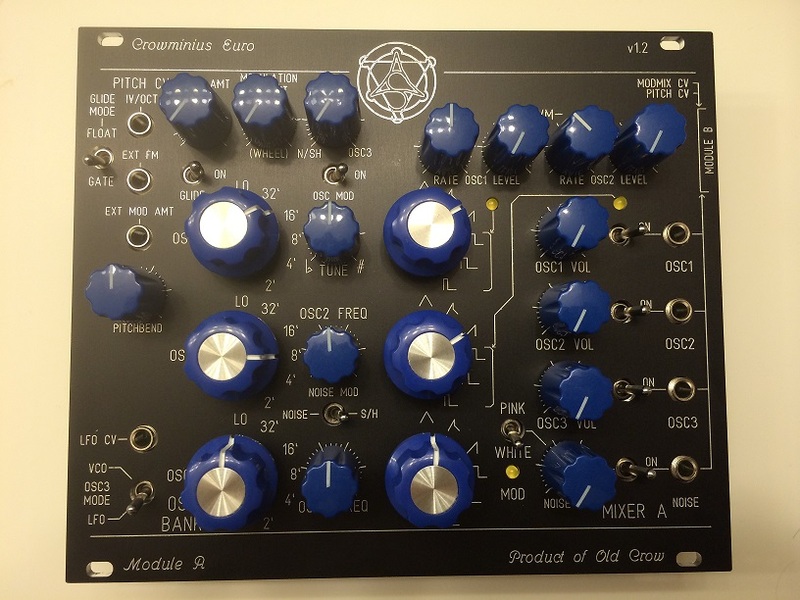 Module B has "MIXER B," which has four inputs, the external audio input with its own gain block and overload soft clipper for line level (or lower) signals, and three inputs for modular-sized signals, topping out at around 8V-pp. 8V-pp max. 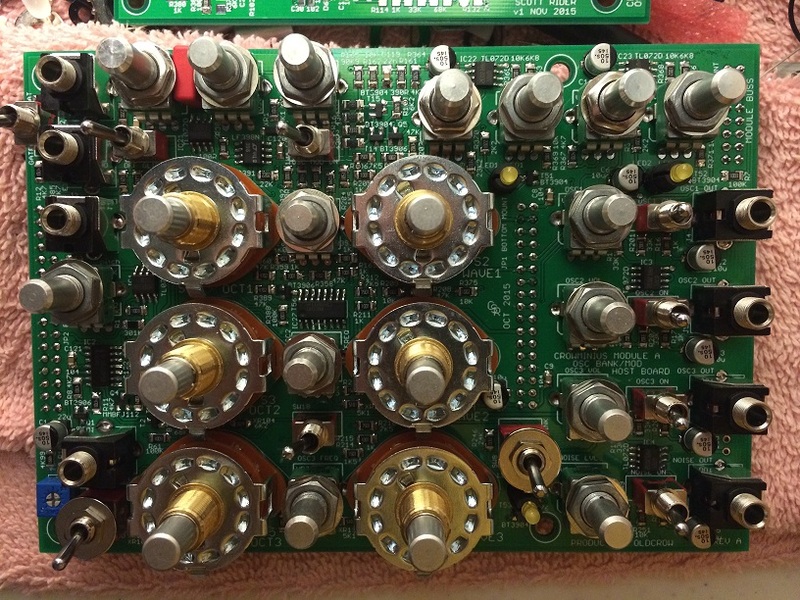 modular signal inputs. 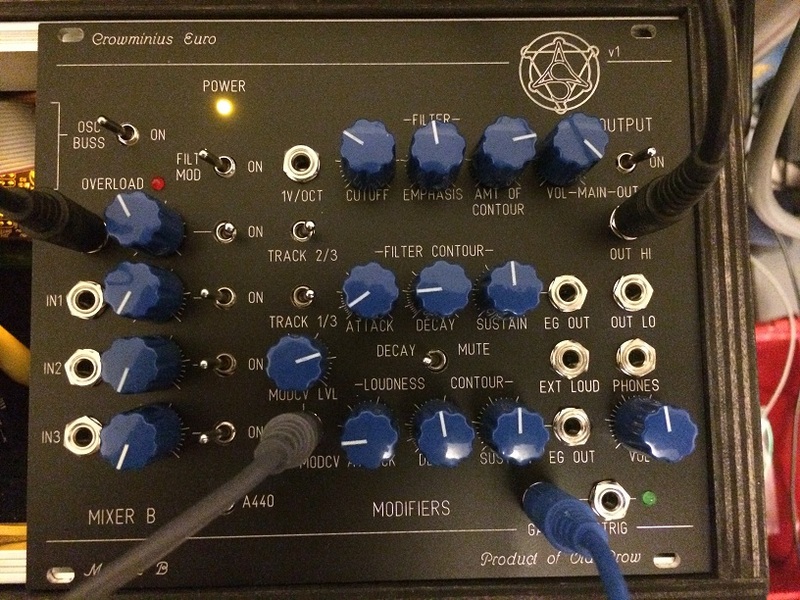 Module B has an "OSC BUSS enable" switch so you can disconnect the osc side if needed. Module A has output jacks for each signal source that are under fader control. These same signals are always sent to the module buss header so as to not need to patch the outputs to the inputs--though if that is what you want to do, go for it. Module A has two sample/hold circuits: one for the LFO S/H mode, and one for implementing a gated or floating glide action. a gated glide stops moving the moment all keys are released while the floating glide continues until it reaches the released key's actual voltage value. Module A also has external CV input for pitch and mod "wheel" controls, and local controls to act as pitch and mod (though not as "table-saw wheels"). 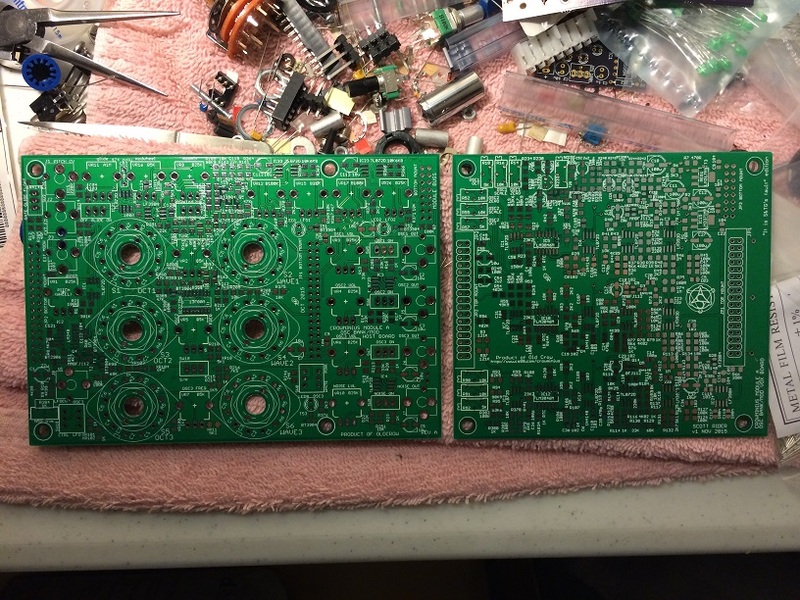 Finally, module A has the two PWM LFOs, one for OSC1 and one for OSC2. 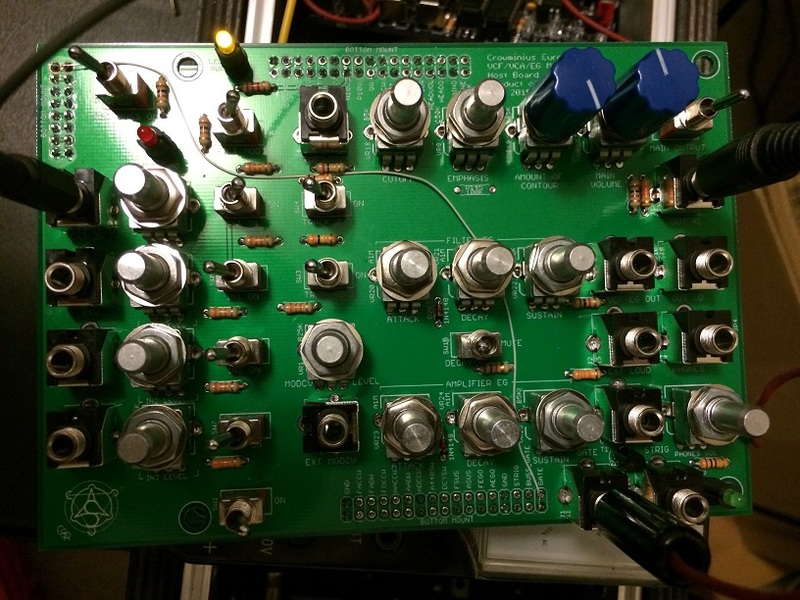 OSC3 has an LFOCV input jack. Due to the tight panel constraints of module A, the modulation output CV for modmix (LFO, noise mod) is in fact on module B, although LFO waveforms except for S/H clocking are also accessible from the OSC3 output jack. All of this is of course on my single-board Crowminius too, I just did a logical split of the synthesizer into two modules, and did a second logical split between the host (panel control) boards and the actual voice circuit boards. I did not include a local MIDICV as in a modular setting you should have one already. 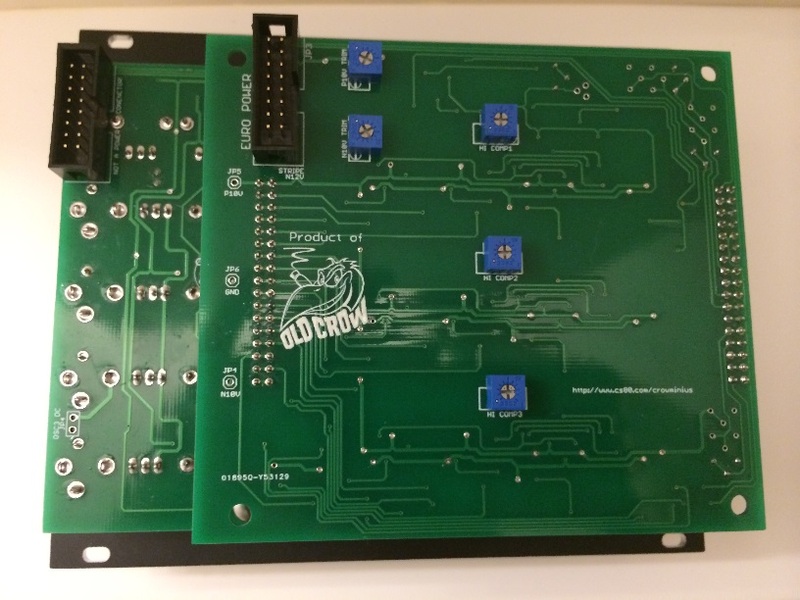 I will have a 10HP 4-channel MIDICV module out after this however, designed to work with both crOwBX Euro and Crowminius Euro. Wow! You have crammed a lot into those panel layouts. I like the layout and am very excited to once again have a Minimoog but in a more compact package and the added PWM is a huge plus. Module B all finished. Taking a turkey week break while module A stuff gets sent to me. Time to build module A.
Module A host board finished. Wow! Very impressive build pics! I am excited to hear this completed! Oscillator board with all SMT soldered. Just 3 connectors and 15 trimmers to add, and ready for testing and calibration. That moment you realize you ordered top-adjust 10K multiturn trimmers instead of side-adjust. Today saw the arrival of the module A panel. Here is how it is all going to go together, once the 10K side-adjust (3296Z) trimpots arrive. Everything is close-fitting, but that is Euro format for you. The host board is tested and the voice board powers up and the supply rails trim, so I expect no issues. 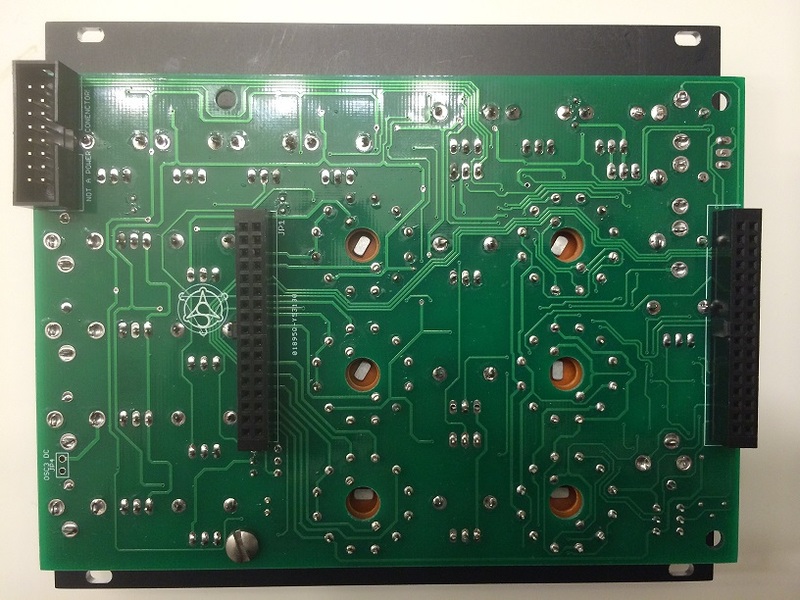 Host board and panel, the connector on the back is the "module buss" to module B. This is NOT a power connector, although applying power here by mistake is harmless. I will doubtless catch flak for using the same header in two different places, but the idea is to reduce the number of line items in the manufacturing BoM. The boards stack up like this. The camera angle makes the voice board look larger than the host, but they are the same corner dimension. It should be all ready to go on Thursday. These look really good. Fantastic work you have done bringing these into life. How do you plan to sell these? Through your web shop or through distribution, or both? One last thing any idea of the price yet? I intend to offer the modules assembled and calibrated. The first batch will be exclusive to my web shop but subsequent batches I will open up to a number of places that have expressed interest. I need to iron out the logistics of production on this first series, which is why the web shop gets them first. In the pipe ahead of Crowminius Euro is crOwBX Euro, however. I am trying to rig production of all of the above at once as they use a common set of parts. Price is not quite known yet. 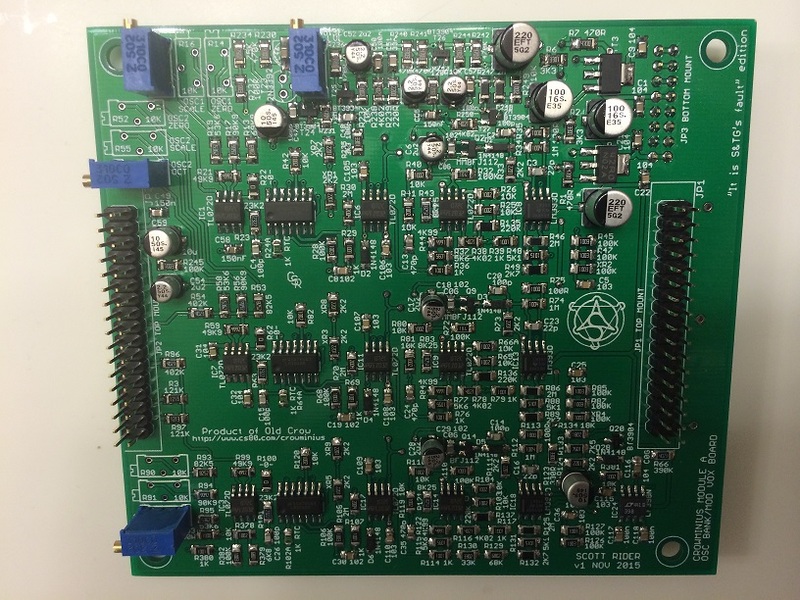 I am estimating US$450 for Module A and US$350~$400 for module B. It really depends on the pricing I can get for the panels and mechanical hardware as those are the bulk of the cost. A demo of the fully assembled system. The only thing I did not make myself is the case. Quick audio demo at the link below, a basic tuned interval lead that uses MIDI aftertouch to apply vibrato. I used my vintage Lexicon PCM unit for a touch of reverb. Other demos will by dry mixes to show specific features. 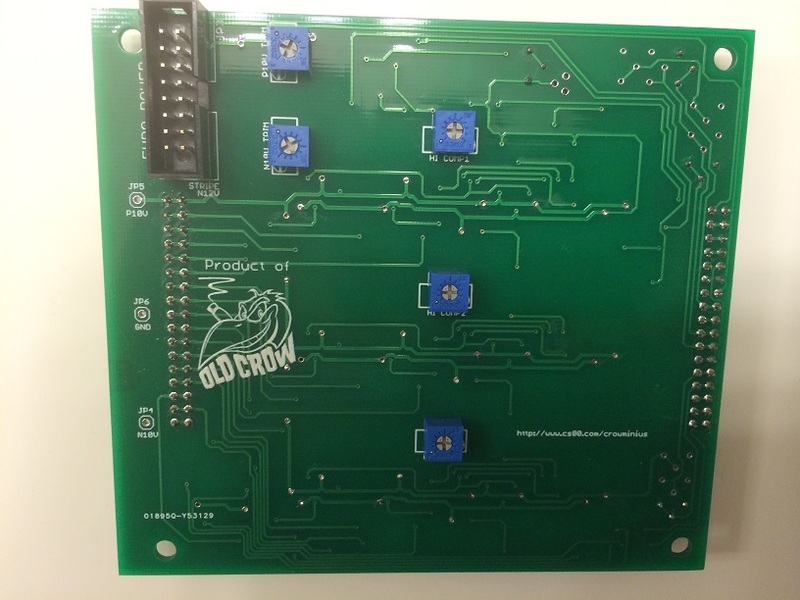 Is that a new Old Crow MIDI to CV module I spy (Corwmidius??). 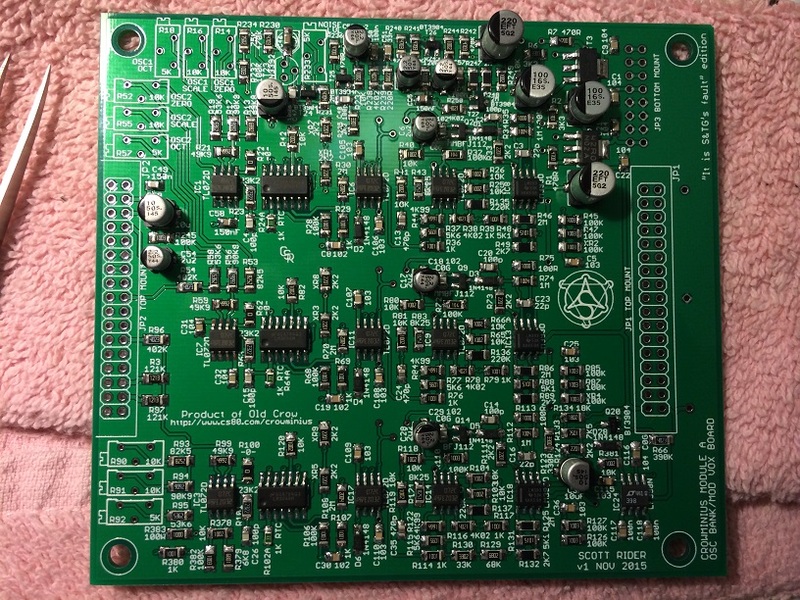 Will that be for sale on CS80.com either as a finished module or DIY in the near future? I will probably offer bare boards for that. 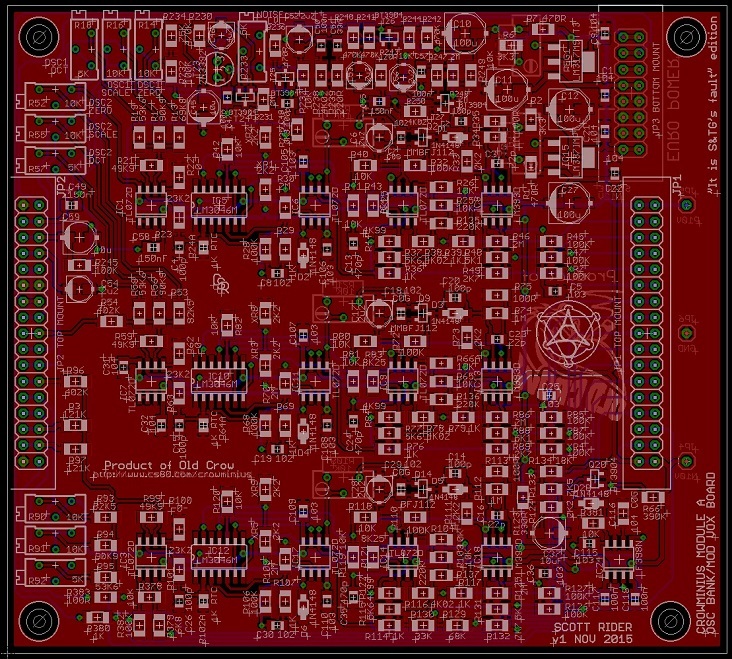 I made it mainly for testing things, but it is a pretty good (12-bit) 4-channel MIDICV. crowbx and crowminius batch builds come first, however.